Renowned physicist Stephen Hawking recently explained his belief that there is no God and that humans should therefore seek to live the most valuable lives they can while on Earth. Hawking's 1988 book "A Brief History of Time" sold 9 million copies, and in it Hawking referenced God metaphorically as the force that could fully explain the creation of the universe. But in 2010, Hawking told Diane Sawyer that "science will win" in a battle with religion "because it works." "What could define God [is a conception of divinity] as the embodiment of the laws of nature. However, this is not what most people would think of that God," Hawking told Sawyer. "They made a human-like being with whom one can have a personal relationship. When you look at the vast size of the universe and how insignificant an accidental human life is in it, that seems most impossible." Hawking's latest book, "The Grand Design," challenged Isaac Newton's theory that the solar system could not have been created without God. "Because there is a law such as gravity, the Universe can and will create itself from nothing. Spontaneous creation is the reason there is something rather than nothing, why the Universe exists, why we exist. It is not necessary to invoke God to ... set the Universe going," he writes. 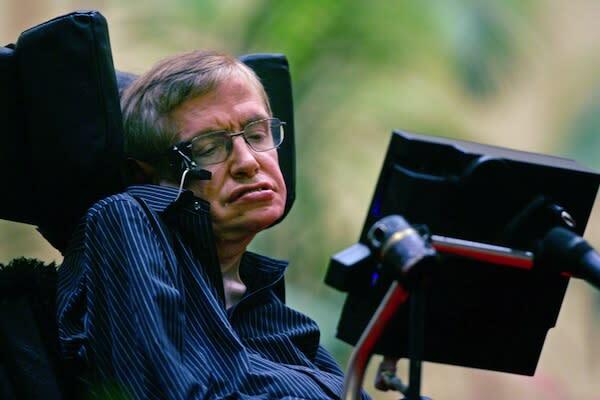 Hawking was diagnosed with the degenerative Lou Gehrig's disease at the age of 21. He lost his power of speech and for decades has talked through an electronic speech synthesizer. The device has allowed him to continue his research and attain a top Cambridge research post, which was previously held by Newton. His most famous theory explains how black holes emit radiation, according to The Guardian. So if everyone is destined to power-down like computers at the end of their lives, what should humans do to lend meaning to their experience? "We should seek the greatest value of our action," Hawking told the paper.